Wake up and dream: Sri Yantra - another way of saying "It's all Math????" 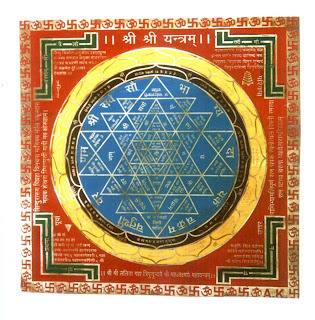 Sri Yantra - another way of saying "It's all Math????" "A hymn from Atharavaveda is dedicated to an object that closely resembles this. The sriyantra ('great object') belongs to a class of devices used in meditation, mainly by those belonging to the Hindu tantric tradition. The diagram consists of nine interwoven isosceles triangles four point upwards, representing Sakti, the primordial female essence of dynamic energy, and five point downwards, representing Siva, the primordial male essence of static wisdom The triangles are ananged in such a way that they produce 43 subsidiary triangles, at the centre of the smallest of which there is a big dot (known as the bindu). These smaller triangles are supposed to form the abodes of different gods, whose names are sometimes entered in their respective places. In common with many depictions of the sriyantra, the one shown here has outer rings consisting of an eight-petalled lotus, enclosed by a sixteen petalled lotus, girdled in turn by three circles, all enclosed in a square with four doors, one on each side. The square represents the boundaries within which the deities reside, protected from the chaos and disorder of the outside world." "Tantric tradition suggests that there are two ways of using the sriyantra for meditation. In the 'outward approach', one begins by contemplating the bindu and proceeds outwards by stages to take in the smallest triangle in which it is enclosed, then the next two triangles, and so on, slowly expanding outwards through a sequence of shapes to the outer shapes in which the whole object is contained. This outward contemplation is associated with an evolutionary view of the development of the universe where, starting with primordial matter represented by the dot, the meditator concentrates on increasingly complex organisms, as indicated by increasingly complex shapes, until reaching the very boundaries of the universe from where escape is possible only through one of the four doors into chaos. The 'inward' approach to meditation, which starts from a circle and then moves inwards, is known in tantric literature as the process of destruction." "The mathematical interest in the sriyantra lies in the construction of the central nine triangles, which is a more difficult problem than might first appear. A line here may have three, four, five or six intersections with other lines. The problem is to construct a sriyantra in which all the intersections are correct and the vertices of the largest triangles fall on the circumference of the enclosing circle. We shall not go into the details of how the Indians may have achieved accurate constructions of increasingly complex versions of the sriyantra, including spherical ones with spherical triangles. Bolton and Macleod (1977) offer a simple overview of the subject; Kulaichev (1984) goes into the 'higher' mathematics implicit in constructing different types of sriyantra." There is, however, a curious fact about all the conectly constructed sriyantras, whether enclosed in circles or in squares. In all such cases the base angle of the largest triangles is about 51°. The monument that comes to mind when this angle is mentioned is the Great Pyramid at Gizeh in Egypt, built around 2600 bc. It is without doubt the most massive building ever to have been erected, having at least twice the volume and thirty times the mass of the Empire State Building in New York, and built from individual stones weighing up to 70 tonnes each. The slope of the face to the base (or the angle of inclination) of the Great Pyramid is 51°50'35. where each number equals the sum of its two predecessors. This sequence aops up in a variety of natural phenomena - in pattems of plant growth and in the laws of Mendelian heredity, for example. It is easily shown that the ratio between successive Fibonacci numbers gets closer to phi the hurther up the sequence one goes. In the Fibonacci sequence given above, the ratio of 233 to 144 gives the value of phi calculated from the dimensions of the Great Pyramid.